Unless you waived it (you shouldn’t), your automobile policy comes with a guarantee that your insurance company will pay you, typically up to $2,500 (you should opt for more, if you can), for medical expenses and lost wages incurred because of a collision. It doesn’t matter whether you were at fault or not. This is extra money that can help alleviate problems in the ordinary automobile collision case—a settlement doesn’t usually happen until well after your medical treatment, so getting some money early on (often within 30 days of submitting those expenses), can help keep you out of collections. Sometimes, after a collision, the most important thing is getting back on the road. If your car was seriously damaged or totaled, you might need something roadworthy right away. Most people believe, rightly so, that the at-fault driver’s insurance should get them a rental and get their car repaired. Unfortunately, there are often unavoidable delays. Sometimes the at-fault driver’s insurance company needs to investigate to determine their responsibilities. They may have a hard time reaching their insured or the driver of their car. There may be questions about how the collision happened, or whether the driver had permission to use the vehicle, or whether the driver was an excluded driver on the policy. 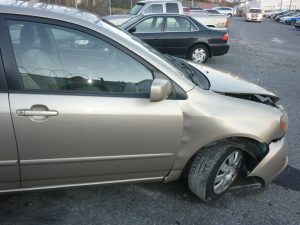 Regardless, the insurance company will not pay for a rental or repairs until they are sure they are responsible for it. In that case, it is usually far quicker to go through your insurance for rentals, repairs or car replacement. When the other side’s insurance company finally finishes their investigation, they will reimburse your insurance company if they believe they are responsible. If not, we may have to file a lawsuit, or your insurance company may need to file a lawsuit, to get reimbursed. Regardless, this is one situation where your insurance company should work for you. The at-fault driver might not have any car insurance, or might have a policy that won’t cover all of your injuries (the minimum in Maryland is a paltry $30,000.00). You can take the other driver to court, and win a judgment against him (a process that will likely take at least six months). That judgment will feel like a win initially, but collecting on it is a whole different story. That driver may not have a job that you can garnish wages from. That driver might declare bankruptcy and have your judgment eliminated. You may need the money sooner. This is why you have insurance. I have always been taught that you must have insurance to protect yourself should you cause an accident. More and more however, I find my clients having high coverage in their policies to protect themselves financially against at-fault parties who are carrying little or no coverage. Imagine getting seriously injured in an accident with hundreds of thousands of dollars in medical bills and lost wages, but the at-fault party only has $30,000.00 in coverage. A case like this could be worth hundreds of thousands of dollars (or more), but if the at-fault policy to cover the damages is low, and there are no assets available to attach, the recovery is very limited. One of our clients was recently involved in a collision where she had a $30,000 insurance policy—the exact same as the at-fault driver. Her infant child was hurt, and suffered catastrophic brain trauma. The best way to protect against a bad and under-insured driver would have been to have a better uninsured policy. The accident wasn’t her fault, and it is regrettable that she should have ever been in a position to have to protect her family. But higher insurance premiums can give you the peace of mind and protection that you deserve. When getting or renewing your policy, it is important to ask yourself how much underinsured/uninsured coverage is enough for you? Our opinion: get as much as you can reasonably afford. Protect yourself not only against lawsuits, but against others who may not be properly insured to cover the damages they may cause to you. We hope it’s not something you will ever need, but if the situation arises, you’ll be glad to have it. If you have questions about making a claim through your insurance company, contact our firm’s founding partner Grant Posner at 410.252.0600, or send us an e-mail at gposner@gposnerlaw.com.